So excited to see that some of my MFA pals have created a new literary magazine! 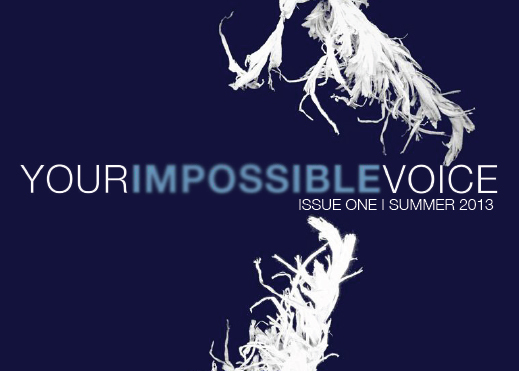 Your Impossible Voice is a nonprofit literary project dedicated to supporting writers and poets and publishing a variety of work from around the globe. If you're wondering what kinds of writing they are looking for, here are the guidelines: "Your Impossible Voice is looking for quality works of prose for our next issues. We are interested in writing from around the world. We would like to receive transmissions from outer space, as well as from deep underground. We are not bored and prefer not to be. We like urgency, innovation, intelligence, risk. We’re interested in what language can do and in challenging our own preconceptions. We love lucid dreams, blurred boundaries, formal play, and stories we’ve never heard. We love the voices of deluded philosophers, hallucinating prisoners, cold-blooded rationalists and insane children. We love realism in the sense that everything is real. We have fairly open minds. Surprise us. Make us think or make us feel or make our brains explode. We are waiting." Sounds amazing. I just picked up the first copy and can't wait to dig in. The debut issue of Your Impossible Voice features new work from Guggenheim Fiction Fellow Jessica Hagedorn set in San Francisco’s gritty Tenderloin District, new poems from Pushcart Prize winner Gillian Conoley, newly translated work from award-winning Salvadoran author Horacio Castellanos Moya, and poetry from Oakland’s own Cave Canem Winner and California Book Awards Finalist Arisa White. Other notable writers appearing in issue one include Pattie McCarthy, Stacey Levine, Peter Kline, Alejandra Costamagna, Aisha Ahmad, Christopher Hennessy, Steve Davenport, Alvin Lu, Colette DeDonato, Matthew Roberson, Daniel Borzutzky, Abeer Hoque, Lisa Williams, and Joe Wenderoth. You can buy a copy here.